The Institute of Public Administration of Canada (IPAC) awards annually a gold medal as a mark of distinction and exceptional achievement to a Canadian who, in the opinion of a panel of independent judges, has shown throughout their career distinctive leadership in public administration in Canada, or who, by his or her writings or other endeavours, has made a significant contribution in the field of public administration in Canada through public service, academic study or knowledge leadership. Individuals from local, provincial, territorial, federal, indigenous governments or academia are eligible for the Vanier Medal – the Institute’s highest honour for public administration achievement. IPAC also encourages submissions from the broad community of practice in this field including those with a diversity of experiences, viewpoints, backgrounds, life styles and experiences. 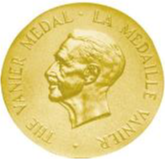 During his term in office, the late Georges P. Vanier graciously consented to have the medal known as The Vanier Medal of the Institute of Public Administration of Canada. Since only one nomination can be selected and in order to respect privacy, the Institute keeps nominations confidential and respectfully asks that nominators and others involved in the process to do the same. Please note that serving politicians are not eligible. Thank you for your interest in the IPAC Vanier Medal. All nominations for the 2019 Vanier Medal shall be made by completion of the following form with attention to the selection criteria. In order to qualify for consideration, nominations must be received no later than March 31, 2019 . The CEO shall refer all such nominations received to a special committee of five independent judges appointed annually by the Board of Directors of the Institute of Public Administration of Canada (as per by-laws). The committee of judges shall decide on or before June 30, 2019 the person, if any, who is to receive the award for 2019. No award shall be made in any year if, in the opinion of the judges, no nomination worthy of an award is received. A nomination may be re-submitted in a subsequent year. - Overview of the candidate contribution, including: Professional activities/occupations with responsibilities and time frames; date(s) of active participation in organizations; all official honours/awards; and any other related information that might assist the Jury Panel in making a decision.